DAYS WITH TEMPERATURES AT LEAST 90 DEGREES IN THE SAVANNAH AREA. EACH DAY FROM MAY 20 THROUGH JULY 14. RECORDS FOR THE SAVANNAH AREA BEGAN IN 1874. OF 80 DEGREES OR HIGHER. EST). DAILY RECORD KEEPING AT RICHMOND BEGAN IN 1897. An exceptional accumulation of very severe natural catastrophes makes 2011 the highest-ever loss year on record, even after the first half-year. Already, the approx. US$ 265bn in economic losses up to the end of June easily exceeds the total figure for 2005, previously the costliest year to date (US$ 220bn for the year as a whole). Most of the losses were caused by the earthquake in Japan on 11 March. Altogether, the loss amount was more than five times higher than the first-half average for the past ten years. The insured losses, around US$ 60bn, were also nearly five times greater than the average since 2001. First-half losses are generally lower than second-half losses, which are often affected by hurricanes in the North Atlantic and typhoons in the Northwest Pacific. The total number of loss-relevant natural events in the first six months of 2011 was 355, somewhat below the average for the previous ten years (390). The Japanese earthquake losses were estimated at $210 billion. See Record Heat for the latest updates. July 15, PM Update: Today's Austin high: 104°. Again. Day 14. July 14, 9 PM CDT Update: Today's high: 104°. July 14, 4 PM CDT Update: The temperature at Austin Mabry was 100° at 4 pm. This is the 13th consecutive day with 100° or higher. July 13, 5 PM CDT Update: The preliminary high temperature at Austin Mabry was 102° at 4:03 pm. The record for the date was 105° in 2009. July 13, 3 PM CDT Update: The Austin Mabry temperature reached 100° at 3 pm, making this the 12th consecutive day with 100° or higher. 5 PM CDT Update: The preliminary high temperature for today was 102° at Austin Mabry. Bergstrom was 100°. Just 2 years after setting the record for the hottest summer in one of the longest official climate records in the U.S., Austin, Texas has had its second hottest June in history. The average monthly temperature of 87.1° at Austin Mabry was half a degree higher than the June of 2009 which contributed to the hottest summer on record. Three of the last 4 summers have been the top 3 hottest at Austin in a climate history which extends back 157 years to 1854. The 10 consecutive days of 100°+ temperatures from June 12th to the 21st tied the record from June 2009. With a temperature of 101° at 4 pm CDT today, this is now the 11th consecutive day of 100°+ temperatures beginning July 2. BEEN AROUND 2 TO 5 DEGREES ABOVE AVERAGE FOR JULY. BELOW...WITH THE YEAR AND AVERAGE TEMPERATURE FOR EACH JUNE SHOWN. HAD 6 CONSECUTIVE 100 DEGREE DAYS IN JUNE 2011 FROM JUNE 14 TO 19. SAN ANTONIO WAS 8 DAYS IN JUNE OF 1980. DAYS IN A ROW FROM JULY 2ND TO JULY 11TH. July 11 Update: About 350,000 remained without power in Chicago as of Tuesday morning. The peak outage estimate was revised upward to 868,000. 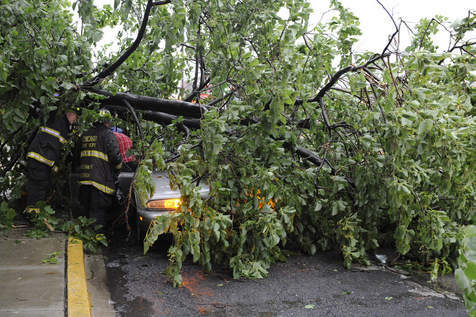 A line of severe thunderstorms brought hurricane-force winds to the Chicago area Monday morning, July 11. Although no tornadoes were reported, the extremely strong straight-line winds produced widespread power outages. At the peak, over 817,000 customers were without electricity. Commonwealth Edison reported that this was the largest outage from any storm in Chicago history. The force of the wind moving eastward across southern Lake Michigan prompted a seiche and lakeshore flood warning as water levels oscillated rapidly by over 2 feet. ESTIMATED 70 TO 80 MPH WINDS ON EAST SIDE OF ROCKFORD. MILE EAST OF RT. 47. OUTAGES. 1 FT DIAMETER TREES AND LARGE BRANCHES DOWN. OUTAGE AND SEMI BLOWN ON SIDE. 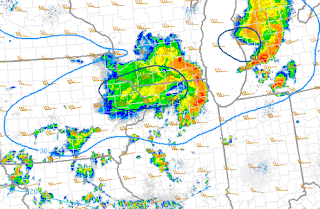 60 TO 70 MPH GUSTS AND HEAVY RAIN. Midnight Update: Added map of July 10 high temperatures. DEGREES. THIS BREAKS THE OLD RECORD OF 110 SET IN 1980. CONTINENT WAS JULY 12, 1980 WHEN THE HIGH REACHED 112 DEGREES. 10 TIMES SINCE JULY 1888. The NWS confirms that the high temperature at Oklahoma City tied the daily record. 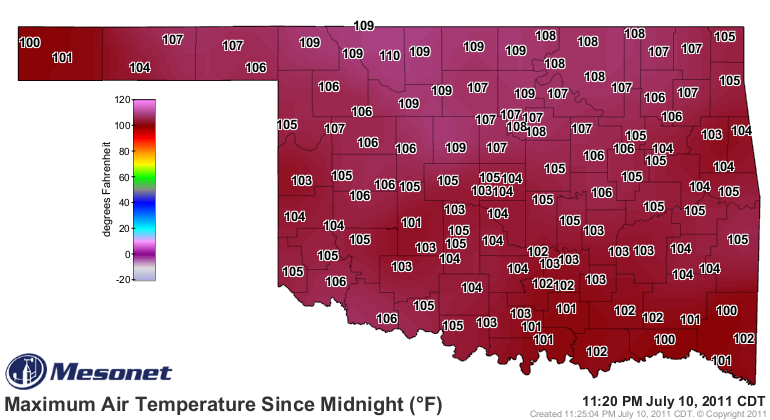 For the second consecutive day, all stations of Oklahoma Mesonet are reporting highs of 100° or above. 4 PM CDT Update: The current temperature of 105° has at least tied the record for July 10 at Oklahoma City. The high of 107° at Tulsa breaks the record for the date of 105° set in 1923 and tied in 1933. Tulsa climate records began in 1882. Fort Smith in neighboring Arkansas also smashed a record from 1933 by 4°. The new record is 108°. Fort Smith's climatological history dates back to 1882. In Kansas, Wichita's 110° for the last 2 consecutive hours has at least tied the record. AS OF 330 PM TODAY...NEW DAILY HIGH TEMPERATURES HAVE BEEN SET FOR JOPLIN AND SPRINGFIELD. FOR JOPLIN...A READING OF 106 DEGREES WAS RECORDED AT 307 PM CDT THIS AFTERNOON. THIS BREAKS THE OLD DAILY RECORD OF 104 SET IN 1980. IN ADDITION...106 DEGREES IS THE WARMEST TEMPERATURE RECORDED IN JOPLIN IN NEARLY 25 YEARS. THE LAST TIME THE MERCURY SURGED THAT HIGH WAS ON JULY 30TH 1986...WHEN THE HIGH TEMPERATURE WAS 107 DEGREES. FOR SPRINGFIELD...A TEMPERATURE OF 102 DEGREES WAS REACHED SEVERAL TIMES BETWEEN 300 PM AND 400 PM THIS AFTERNOON. THIS IS ALSO A NEW DAILY RECORD FOR SPRINGFIELD...BREAKING THE OLD RECORD FOR JULY 10TH OF 100 DEGREES...SET IN 1980. THE LAST TIME IT WAS 102 IN SPRINGFIELD WAS ON AUGUST 15TH 2007. 2 PM CDT Update: So far this summer, 5 daily high temperature records have been set or tied in June and 2 in July at Oklahoma City. The 120 stations of the Oklahoma Mesonet, representing each of the state's 77 counties, all reported temperatures of at least 100° Saturday, July 9. For much of the state, readings were 110° or higher, with the maximum of 114° at Freedom. In all, 53 of the stations were 110° or above. At Oklahoma City, where records date back to 1890, the high of 110° broke the old daily record from 1964 by 4° and tied the all-time July high temperature record last reached in 1996. With the temperature hitting 100° at noon today, this is now the 12th consecutive day with temperatures of 100° or higher. The average daily high temperature so far this month at Oklahoma City is 103.9°. PREVIOUS RECORD OF 106 DEGREES SET IN 1964. WAS 112 DEGREES ON AUGUST 10 1936. 4 TO AUGUST 25 1936. 1996...THE LAST TIME THAT THE HIGH TEMPERATURE REACHED 110 DEGREES.